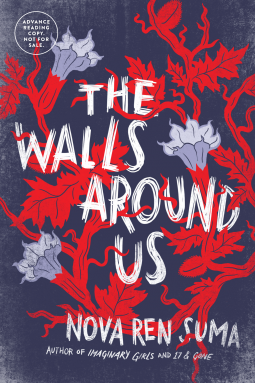 The Walls Around Us is a ghostly story of suspense told in two voices—one still living, and one long dead. On the outside, there’s Vee, an eighteen-year-old dancer days away from the life of her dreams when something threatens to expose the shocking truth of her achievement. On the inside, within the walls of a girls’ juvenile detention center, there’s Amber, locked up for so long she can’t imagine freedom. Tying these two worlds together is Orianna, who holds the key to unlocking all the girls’ darkest mysteries: What really happened when Orianna stepped between Violet and her tormentors? What really happened on two strange nights at Aurora Hills? Will Amber and Violet and Orianna ever get the justice they deserve – in this life or in another one? We hear Amber’s story and Violet’s, and through them Orianna’s, first from one angle, then from another, until gradually we begin to get the whole picture – which is not necessarily the one that either Amber or Violet wants us to see. What I Say....This book could have easily been a 5 star read. Could have, but wasn't. The storyline was good and the characters were interesting. But I got lost in the author's desire to write an important book. The prose was heartfelt (you could feel the author, you were aware of the author the whole time), but it tended to go on too long and seemed to ramble at times, rather than building up to the suspense of the story. There were no clues in the beginning to help you understand that you are reading a ghost story, so when the book made that sudden turn about a third of the way through, it didn't shock me as much as it confused me. I had to go back a few pages and try to make sense of what was happening. At the end, the exchange of girls (I won't say anymore, no spoilers here) didn't make any sense and didn't seem realistic (I understand I'm reviewing a ghost story, and should I really expect realistic, but don't the best ones make it seem like it could happen?). It felt like a rather abrupt happy (?) ending. I still give it 3 stars, it was a good book, but it was frustrating as a reader to feel like it could have been a GREAT book. I received a free ARC from NetGalley in exchange for an honest review. The only kind I give.